Also, he argues that proper planning involves many steps (like GTD), so people resort to email that defines their agenda (p. 59). We can’t just lock ourselves in this “perfect room” and make perfect work (p. 98). It is due to the fact that our mind is filled with desires all day (p. 99). Routines and rituals should help us overcome this problem (p. 100). There are two main approaches to deep work: monk-style (fully eliminate what is less than important) and chunk-style (limit when we allow busyness in our lives). Most of can’t go monk-style for a number of reasons (p. 102). To keep those deep work chunks consistent, we can use chain method: we commit to deep work under certain conditions (e.g. every weekday from 9 to 11) and keep track how many consecutive times we stuck to the commitment (p. 110). 90-minute chuck might be a good starting point for your experiments (p. 112). For this, you might want to think ahead what exactly will you do when you get a chance to concentrate (p. 120). “Great creative minds think like artists but work like accountants” (p. 119). It’s not necessary to think in the closed room. Newport was thinking about his PhD on the go all the time (pp. 121, 144, 170). If you are struggling to make progress, try changing the environment (p. 123). Deep work does not preclude collaboration. Hub and spoke model is discussed on p. 132. 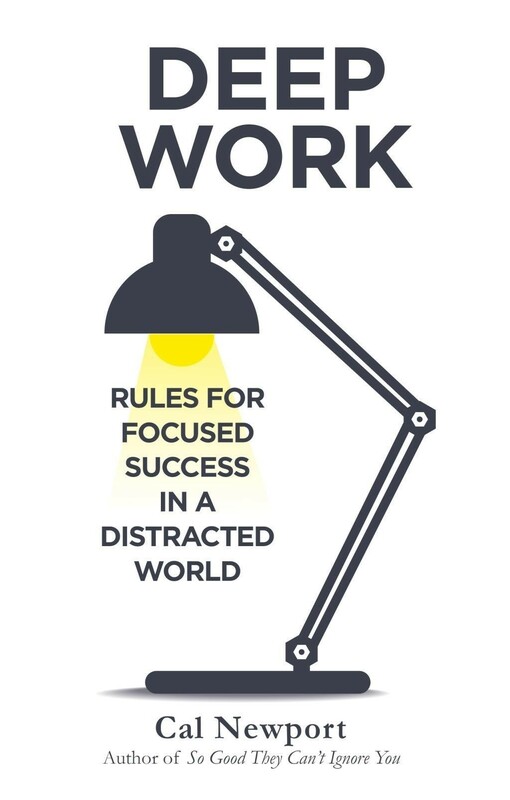 More work means less focus. Practice laser focus. Keep lead (e.g. number of new bugs this week) and lag (e.g. number of 5-star reviews last month) measures of your work. Track your deep work and important achievements. Do your own “performance reviews”. To combat attention residue, walk in a low-distraction environment (e.g. a quiet park) for 50 minutes. If keep alert during this time, it won’t work. But the place doesn’t have to be nice and cosy (experiment worked even when it was cold outside, see p. 147). When you finish your day, it’s important to convince your brain that you can pick up the work tomorrow and there is nothing to worry about. He suggests a form of “brain dump” (p. 151) with actionable points at the end of the day as well as a plan for tomorrow (p. 152). We are not just getting distracted by notifications and stuff: we are at WAR with the social media and notification-driven apps, because they are designed to be addictive (if you think it’s a joke, read Hooked: How to Build Habit-Forming Products). We tend to underestimate the time we spend on things. UK youth spent around 10 hours a week more than it thought (meters recorded 28h vs 15h estimated in the questionnaires). The main approach is to use only tools that have far more benefit than the amount effort/resources they require from you (p. 187, 191). When you want to procrastinate or just need to use those tools, set yourself an allowance and make sure they don’t creep in your work chunks (e.g. check your email every 45 minutes vs enabling notifications, p. 163). Usually, there are no more than 4 hours of deep work you can do well every day (p. 220). To make the best use of your workday and reflect on wasted time, set yourself a daily schedule and record the actual one, but instead of checking how well you stuck to it, check whether things you did instead were more important (pp. 222, 227). How to measure important work? Estimate how many months will it take an intern to learn how to do it for you! (p. 231). You need to stop somewhere. Set yourself a daily limit. You might think that it’s impossible, but you can do more work per hour if you commit to X hours of work a day. Self-praise and motivating examples on p. 236. If anybody asks you for some commitment that would require you to either shift priorities against the importance of the work or work more than X hours, find a way to ditch that commitment. Common excuses on p. 264. When you communicate with people, think not about what is going to answer the question of your colleague, but what is going to help him to stop asking further questions (p. 249). If the email is badly composed (hard to understand, requires additional research) and nothing will set on fire if you’ll ignore it, then just ignore that email.